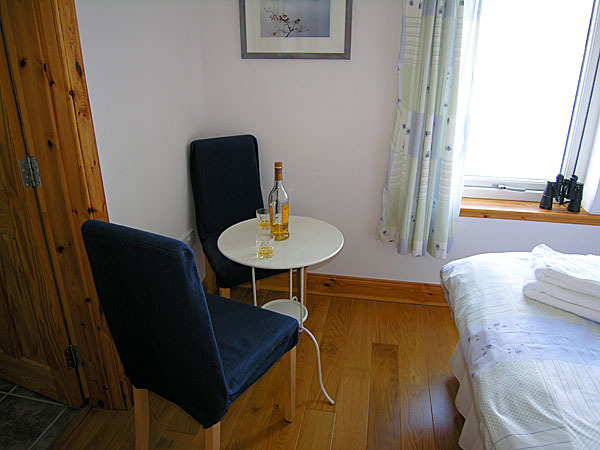 Accommodation at Perelandra Bed and Breakfast, Isle of Skye. 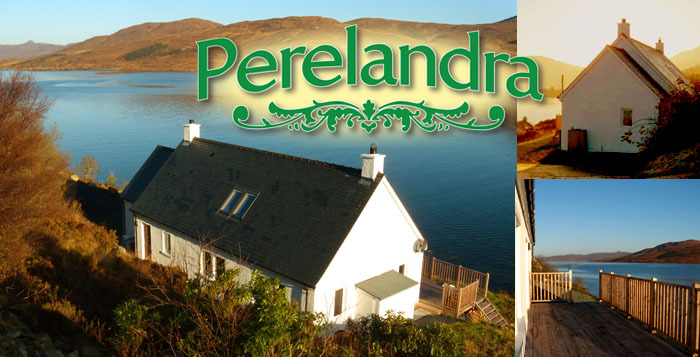 Perelandra is our new house, built by local tradesmen to a traditional design and completed in May 2011. 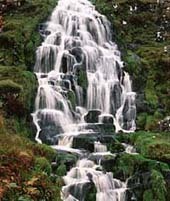 It stands on the shoreline of Loch na Cairidh which is a tidal sea loch on the east coast of the Isle of Skye. We have a wealth of wildlife passing by, including seals, otters, herons and more than 50 species of birds. Porpoises are occasional summer visitors. 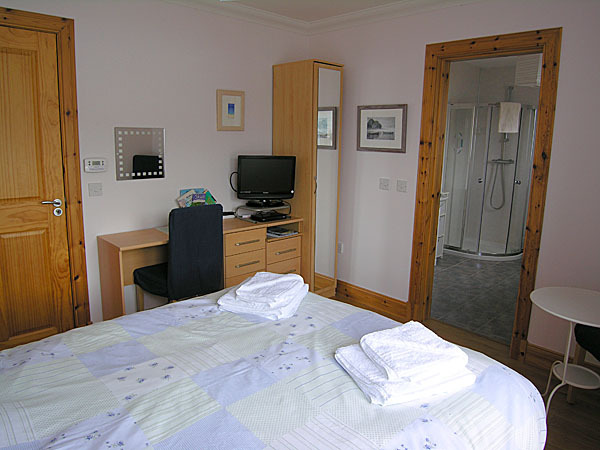 We have just one guest room at Perelandra which is a double room with en-suite shower-room. The room sleeps two people in one large bed. It's very bright and airy and has spectacular views out over the water and to the mountains beyond. There's plenty of storage space, a TV with DVD player, tea and coffee making facilities, hairdryer, maps and guides, binoculars for wildlife watching, a small table and chairs, and free WiFi. If you are travelling without a laptop we'll even lend you one! 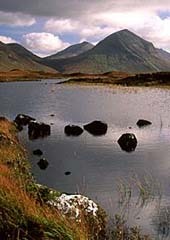 Admire the view while you enjoy Scotland's national drink, perhaps? 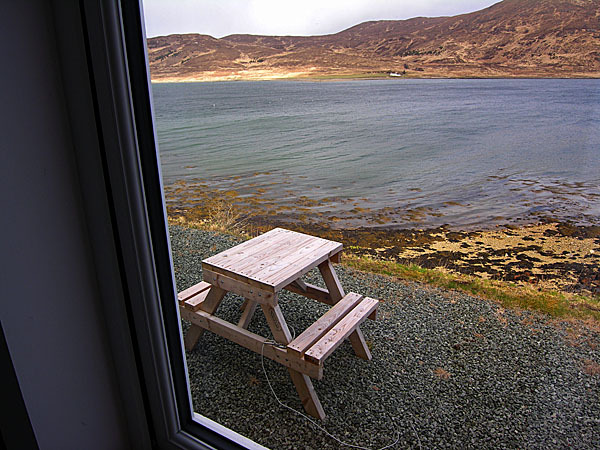 There's a picnic table outside the window which you are welcome to use. And, yes, the water really is that close!. 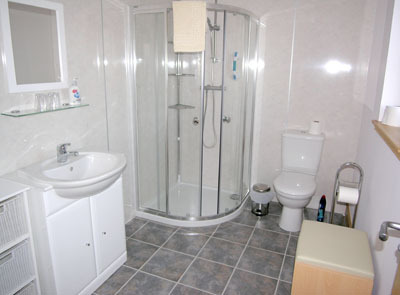 The room has its own spacious en-suite shower-room with large shower, wash-basin and toilet. All the guest accommodation at Perelandra is on the ground floor. There is a ramped path to the front door, and the shower cubicle has a low threshold and a grab rail. Perelandra may therefore be suitable for some people with mobility difficulties, but if you have these concerns please talk to us first before booking. The guest bedroom's en-suite shower-room at Perelandra. 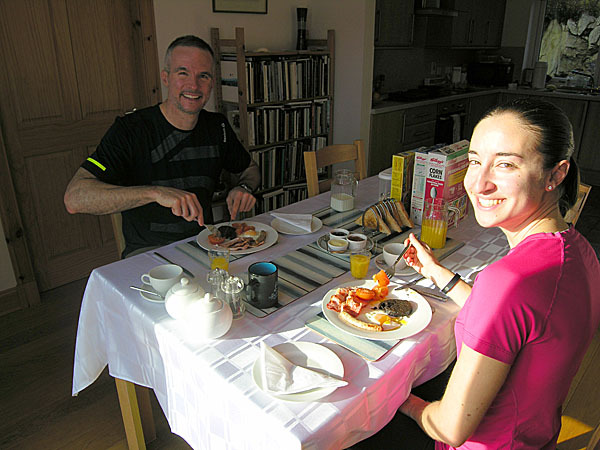 Breakfast is served in our Dining Room: another room with spectacular views over the water. 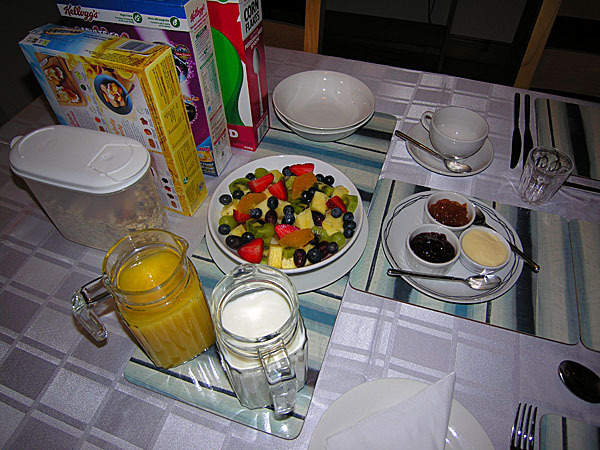 You can choose from a varied menu which includes the traditional cooked breakfast, vegetarian cooked breakfast, or lighter alternatives and healthy eating options if you prefer. We use local produce wherever possible including lovely free-range eggs, and we make our own bread. Our fresh fruit salad and home made bread are popular. 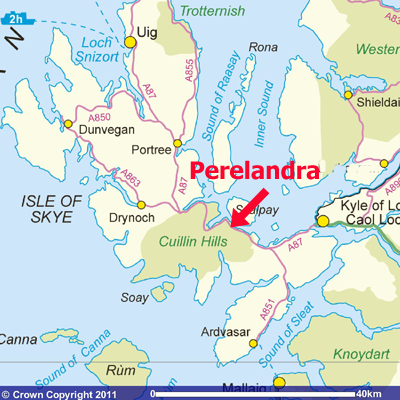 At Perelandra you'll find everything you need for an enjoyable stay on the Isle of Skye. Your hosts have a wealth of local knowledge and will help you get the best from your holiday, however long or short it may be.